Yay for Friday!! Today was so hectic for me so I wasn’t able to take nice photos outside but I did take a quick shot of my outfit. I was in Hoboken all afternoon with a friend and it was such a nice day to be outside! I literally put this outfit together in 5 minutes and I’m really happy with the turnout. Very cute, colorful and casual! 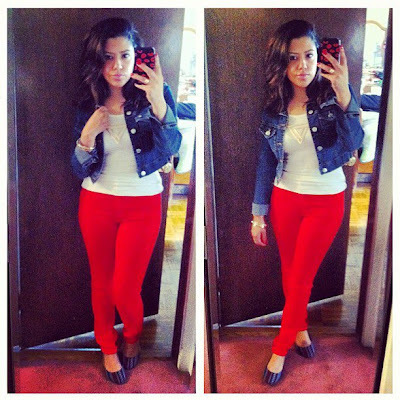 I’m wearing red skinnies from H&M with this micro tank from Target. I paired this with my denim jacket and Target flats. My necklace is from Gypsy Warrior and my bracelets are from Forever21. Denim jackets are so big right now. They go great with so many things and are a perfect little jacket for warm days with a cool breeze. I’m so happy that I held on to this one for so many years because for awhile, I stopped wearing denim jackets. Now that I am so used to taking good photos with my mom I hate taking these pics in the mirror but I feel like I need to still be able to show you all my outfit! lol Once again, don’t forget to enter my contest! I will remind you guys every day till it ends! Hope that you enjoy this weekend!! Were you able to break the shoes in? I am having the similar problem about the size.